Found a Harbor Freight coupon for this in the latest issue of Wood Magazine for $49.95 (lists for $99.99), so I thought I would run down to my local Harbor Freight and check out the “floor model”. After looking it over I decided to go ahead and make the purchase. It unpacked easily and was a breeze to setup. Basically just have to attached the table. For the most part this is a pretty decent machine for the price, good cast iron parts except for the table and the disk; which are both machined aluminum. It seems to work ok on the few test pieces I used it on and think it’s a pretty good deal for the sales price. I have always been a bit wary to purchase power tools from Harbor Freight, but this one seems to be ok. As usual, do your own due diligence! Don’t be afraid of HF. One just has to be judicious about what is purchased there. I have a lot of items from HF and have only been dissatisfied once or twice. Let us know if you have found another Gem. Thanks for the review; I was just thinking today that I need a belt sander. I’ve heard good reports on that sander. Which is more than I can say about the comparable models from Skil and Black and Decker. Just for comparison. 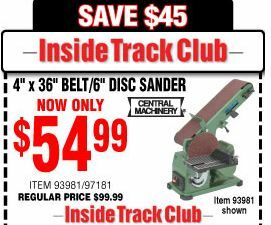 The “Inside Track Club” current ad has the same sander for ”$54.99”. One can’t combine coupons so that would be your final price. I am finding that just like anything else, you have to be diligent if you want the best possible deal. Here’s a screen shot but I won’t post the UPC as I don’t want to violate copyright. I bought this same belt sander. I promptly returned it to the store the next morning. My sander was so underpowered that you had to start the belt by hand, then it would stop after you tried to sand anything. I bought a a Craftsman belt sander and have been very happy ever since. I am happy to hear that you had good luck with you’re sander. I have had some power issues with this as well, it basically gets used on a limited basis, but heck I think I paid 45 for it on a sale. My next problem came when the grounding post on the plug came out when I unplugged it from the wall and stayed in the outlet… so I cut the plug off and put in a new grounded plug. But the most recent problem was that the tension handle just came off in my hand when trying to loosen the belt. It’s like the pin that it pivots on fell out. Oh well, all of these things can be dealt with and I wasn’t expecting anything when I bought it. so aside from the low power I’ll still be able to make it work normally. I’ve had one for a year and used the Wood magazine coupon. Most important thing is to go to Lowes and buy a new belt. The HF belts have a lump where they join them that is horrible. I just put the disk on this week and it seems ok. Power hasn’t been a problem. It physically doesn’t seem much different than the other brands on the outside so the almost uncontrollable dust is probably normal. twoblacklabs – That is hillarious that the “inside track club” coupon doesn’t at least get the same price as the Wood magazine coupon. Harbor Freight has some real gems for a great price and they have some JUNK! Just be careful and check out the floor model when you can. Currently I have (and I’m happy with) the Central Machinery: Oscillating Spindle Sander, 33” Lathe, & 12” disc sander. I also have the 1×30 belt sander but it is really underpowered although it works well for the little jobs I got it for. HF is really good about returns if you get a bad machine. That said, the handheld power tools seem light weight and cheaply built so I have stayed away from them. Their pipe clamps and bar clamps have served me well but I have heard of some failing others. They are not selling high-end tools with all the bells and whistles but have some really good tools. Just do your research and know what you want in the tool you’re looking at purchasing. My shop has limited space due to too many things in it. I needed a band saw, but couldn’t afford to dedicate floor space for one. I’d seen the Rikon 10” at woodcraft, which was the perfect bench mount size for me, but a little too pricey at $300. Then I saw the identical saw at Sears for $200 with the Craftsman name on it. Couple months after owning the Craftsman, I saw it again at HF with their log at $130. Only difference was the Rikon/Craftsman had bearing guides and HF had fiber block guides. Sometimes the tools are just reconfigured pieces or simply rebadged. I agree on the power hand tools, they seem real thin plastic shells. So far this sander has met my expectations; but as others stated if you are wanting to “hog sand” a big piece on the belt, it will bog down. But all in all, for what I needed this fits the bill. Another plus is since my workshop is really small, it’s nice that I can fit this under my bench and out of the way when I don’t need it. All in all, not a bad deal for $49.99…. I have many HF tools and have been very happy with them. As far as paying 2X why would one do that what the tool probably came off the same assembly line, Just has a different name and paint. We had this discussion on a review I did on a HF Air tool. The HJ wood lathe and the Jet lathe are identical down to the part numbers and parts diagram. Why pay 1000.00 for the jet when you can get the HF for 250.00. And the staff at Harbor Freight are American and they have to eat too. My wife got me one of these for Christmas a little over a year ago along with a drill press & bench grinder. Bench top drill press got returned unopened (ended up with a Craigslist 17” Steel City I’m happy with for less than the tiny HF unit). The stock sandpaper has a huge hideous lump in it, although I haven’t bothered replacing it yet. I tinker more than do fine woodworking, so have been grinding some rough steel with it and can’t be bothered to put decent paper on it at the moment. Fit & finish is about what you’d expect for a HF unit, a bit lacking, but generally passable. The stop at the end of the belt lets stuff slide under and jam the belt easily. No dust collection & the adjustments are pretty sloppy, but it gets the job done. I want and should have a nice quality unit, but the little HF unit does a good enough job to keep me from bothering. I wouldn’t qualify it as a HF gem, but it’s marginally better than most HF crap and worthy of a purchase if you need a cheep decent tool.